Shell's profits rose by almost a fifth in the last three months on the back of higher production and oil and gas prices. The oil company said that it had also approved two new major projects, including one deepwater project in the Gulf of Mexico, which will further boost production in the future. Risteard Ó Domhnaill’s documentary film about the Corrib Natural Gas project in County Mayo Ireland, The Pipe, has been quite a long time in the making – but the wait has been worthwhile. This is a moving, unsentimental and compelling story well told and, particularly, well edited (by Nigel O’Regan) of how ordinary people in a remote community fought with a multinational company, Shell, to protect their community and their livelihoods. Investigation by Al Jazeera online correspondent finds toxic illnesses linked to BP oil dispersants along Gulf coast. Two-year-old Gavin Tillman of Pass Christian, Mississippi, has been diagnosed with severe upper respiratory, sinus, and viral infections. His temperature has reached more than 39 degrees since September 15, yet his sicknesses continue to worsen. His parents, some doctors, and environmental consultants believe the child's ailments are linked to exposure to chemicals spilt by BP during its Gulf of Mexico oil disaster. Shell to Sea Note: [Shell to Sea was proud to be asked to have one of our number be a judge for this contest in memory of Ken Saro-Wiwa and the rest of the Ogoni Nine. Cornelius King of Shell to Sea was one of the 9 judges. Peak Shamrock: Oil at the end of the rainbow? Earlier today I sent an email to Richard Wiseman, Chief Ethics & Compliance Officer of Royal Dutch Shell Plc advising him of alleged death threats made against Shell Corrib employees, who for some months have been leaking Shell internal emails to us, which we have published. 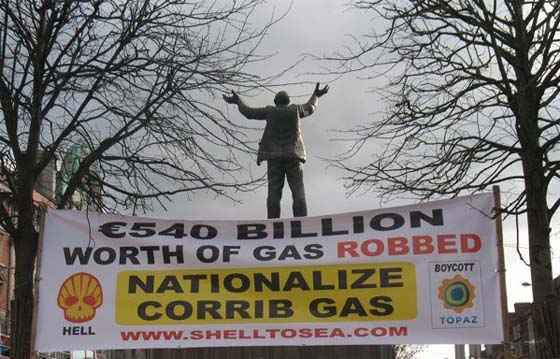 I supplied to Mr Wiseman the latest batch of leaked emails together with a draft email we intend to send to the Irish Police Commissioner reporting a Shell espionage operation against Shell Corrib employees and alleged related death threats.